Quickly: 2-6 players, 30 minutes to play, digital version for $10. Beasts of Burden is a quick-playing game of treachery and debauchery that happens to center around constantly swapping items in your inventory. In short, players carry around weapons, tools and treasures, each with separate weights, values and uses in order to defeat monsters and puzzles in a nine-card grid in the center of the play area (the “dungeon”). Players must constantly swap items in their pack to stay below their weight limit while trying to earn as many points as possible, through solving puzzles, killing monsters,avoiding traps, collecting treasure and solving quests. Throw in some traps (you play them in front of other players to prevent them from adventuring in the dungeon) and some curses (Tiny Legs reduces the amount of weight you can carry and TRANSMUTATION! allows you to add weight to items, among many others) and you have a fast-playing game of hoarding, mayhem and backstabbing, all illustrated by Nikki Burch! So not only are you getting a kickass game, you’re basically getting over 100 pieces of art! You’ll practically be a Carnegie! Or perhaps a Mellon! The game ends when someone completes a quest, or when another player punches you for repeatedly placing traps in front of them and pickpocketing all their treasure. “But Stuart!” You say, rhetorically. “I’m but a lowly adventurer and can only carry ten units of weight! Surely that will limit the amount of fun I have? 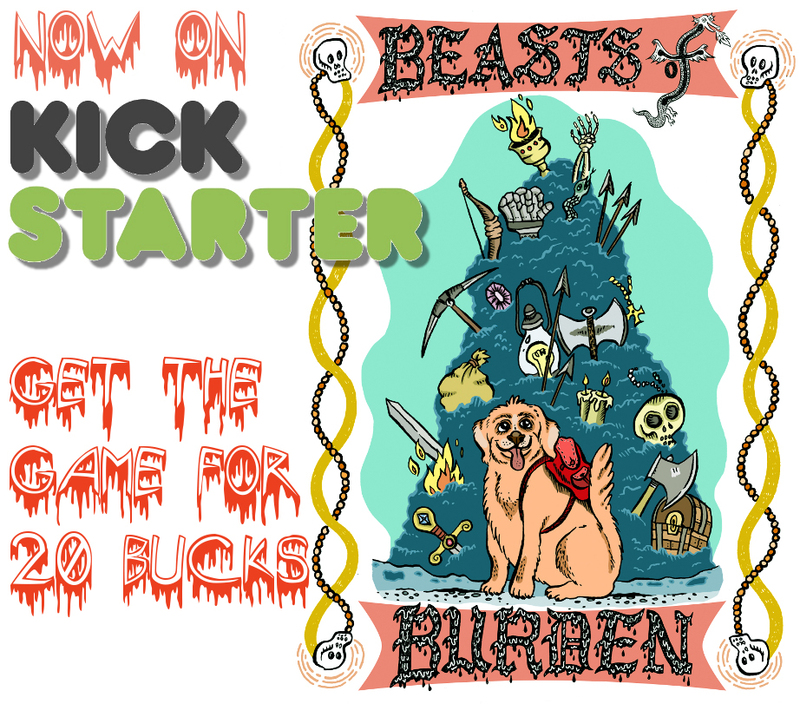 Put Beasts of Burden into your huge sack on Kickstarter today!